At the Sturgis Bike Rally, Devils Tower is just a short ride. It's a must-see at the Sturgis Bike Rally. "At the Sturgis Bike Rally, this is the most impressive natural wonder in the Black Hills...it beats Mt Rushmore to pieces..."
Some things at the Sturgis Bike Rally get bigger and bigger the closer you get. Devils Tower is one of those things. It's huge. 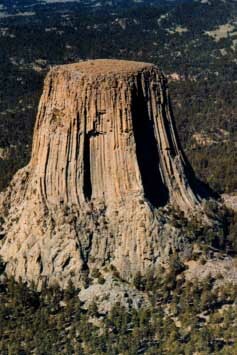 At the Sturgis Bike Rally the Best Big Thing has to do with Nature - Devils Tower National Monument. Let's face it, no one comes here for the cultural mystique of the ballet. The Black Hills are however, a great place for the outdoors at the Sturgis Bike Rally. Devils Tower isn't pushed as hard by tourist promoters. Perhaps the reason is because it is across the state line in Wyoming, and is further from the main tourist areas on the South Dakota side of the Black Hills. Everyone in the tourist business and all the promotions key on Mt Rushmore. Devils Tower National Monument is just there - as one of the best visits at the Sturgis Bike Rally. Well, in my opinion Devils Tower is a lot better than Mount Rushmore. It's big, and will be a highlight of any visit to the Sturgis Bike Rally. You can see it off to the north as you bike down the Interstate in Wyoming. It's in the Wyoming portion of the Black Hills near north of Sundance. Granted, it doesn't look like much from a distance. But that's deceiving. The closer you get, the bigger the tower gets. And when you get right up close to it, Devils Tower is the most impressive thing in the Black Hills. It's huge. You understand why it was a magical place for the Lakota and Cheyenne in the northern Plains. Legend has it that the vertical cracks were caused by a giant bear that was trying to climb it. Today, human climbers go up it. It's a favorite rock climbing location. As you stand down below, you can usually spot climbers making their way up the tower. But it's controversial, too. Devils Tower is considered sacred by many Indians, and the rock climbing disturbs some people. It's seen as being an invasion of the power of the place. You may also want to check out the Black Hills trout fishing in this area at Sturgis Bike Rally Fishing.